THE CENTER OF THE UNIVERSE - A mordantly funny memoir guaranteed to make you feel better if you think your family is crazy. "Dazzling. A darkly comedic style that recalls David Sedaris or Joan Rivers. It's Bachrach's ear and eye for language that makes her voice distinct and haunting." Nancy Bachrach worked in advertising in New York and Paris, "spinning hot air like cotton candy." Before that, she was a teaching assistant in the philosophy department at Brandeis University, where she was "one chapter ahead of her class." She lives in New York City. This is her first book. "You couldn't make this up...a hilarious account of [her mother's] recovery...from 'permanent, irreversible' brain damage." "The tale of Lola's instability alone would earn this book a prize spot among the ever-growing genre of crazy-mother memoirs. But this one also has a can-you-believe-it twist straight out of daytime TV...."
"Piquant and ribald...Bachrach's prose is wry, risky, and feels like she has found her moment at last." "Bachrach finds her literary voice. Spirit is written into every chapter." "Hard to put down: This zany family memoir is the ultimate mother-daughter story." A mordantly funny memoir guaranteed to make you feel better if you think your family is crazy. The story is so improbable, it can only be true: A brilliant woman with a long history of mental illness — who once proclaimed herself to be "the center of the universe" — is miraculously cured by accidental carbon monoxide poisoning aboard the family boat. Nancy Bachrach warns readers, “Don’t try this at home” in her darkly humorous memoir about “the second coming” of her mother — the indomitable Lola, whose buried family secrets had been driving her crazy.Aching and tender, unflinching and wry, THE CENTER OF THE UNIVERSE is a multigenerational mother-daughter story—a splendid, funny, lyrical memoir about family, truth, and the resilience of love. 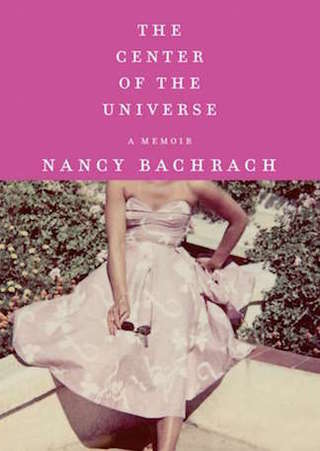 "Bachrach’s moving memoir is just out from Knopf. That it’s harrowing isn’t surprising — but that it’s shockingly funny is. When I went to hear Bachrach read to a large crowd in New York, she was constantly interrupted — as she wished to be — by the audience’s laughter." "If there's a black-comic angle, Bachrach will find it....Bachrach's book – unsentimental and all the more moving for it – is ultimately about a universal condition: the renegotiation of the adult child's relationship with her parent." "...a fascinating blend of dark humor, stark reality and crisp writing." "The Center of the Universe is a beautifully written symphony of lunacy and hilarity. Nancy Bachrach has the comic touch."